After three games on the long and grueling NBA docket, 76ers Head Coach Doug Collins has yet to notch his first W as the Sixers fell again last night to the Pacers in Indianapolis 99-86. Unlike Friday’s loss to the Atlanta Hawks, there’s not much positive we can take from this one. 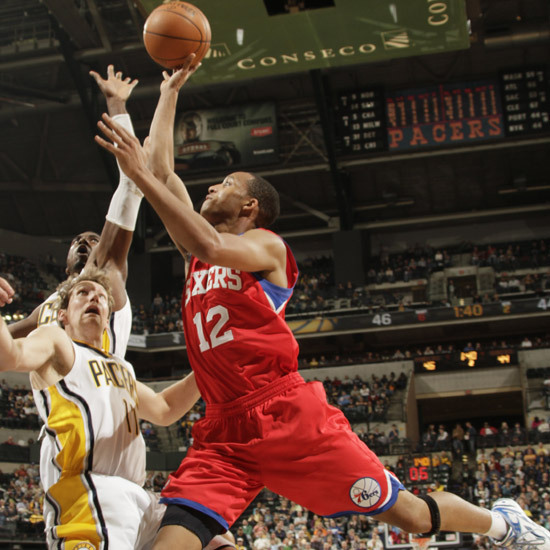 The 76ers could only muster 35 total points in the second half Saturday night. The starting five hopefully had one of their worst scoring performances of the young season — Andre Iguodala, Elton Brand and Jrue Holiday all tied as the leading scorer among the starters with 12 points. The Sixers got outscored on the fastbreak (18-15) and in the paint (46-40). Indiana also owned the boards (51-46) and attempted 25 free throws, compared to the Sixers 16. Yikes. If it wasn’t for Lou Williams seven-for-eight shooting display (18 points), this game could have been a lot uglier. Just three of Iguodala’s 10 shots were within the paint and as we all know, for the 76ers to use AI9 to their advantage, he needs to stop pretending like he’s a shooter in this League. Yes, he can drain the occasional deep two-pointer just inside the arc, but his slashing abilities in the lane are the reason why he is the number one option for Philadunkia’s home team. Saturday night’s contest was played sloppily by both teams. Still if you’re the road team, like the Sixers, you can’t turn the ball over 19 times and expect to pull out the victory. Iguodala and Lou Williams each threw the ball away five times, negating a bunch of any momentum the Sixers had, especially in the second quarter. Philadelphia led by as much as 13 in that quarter. But some credit is order for Indiana’s new point guard Darren Collison. Collison finished ith 15 points, four steals and four assists. The Pacers can now operate as a fast break team and did so quite effectively during their 13-0 run in the second quarter, which was timed perfectly to cut down the Sixer double-digit lead. Surprisingly Tyler Hansborough (nine points) a main contributor on the Pacers run, hustling down the court and draining a baseline jumper. But it was Collison who stood out throughout the entire game. He even provided the top highlight of the night, throwing down a monster slam in transition on Louis’ head. The key matchup I had circled before last night’s game was the Darren Collison vs. Jrue Holiday matchup. Both were teammates at UCLA and were drafted four picks apart in the 2009 NBA Draft (Holiday-17th, Collison-21st). There’s no denying Collison’s game is more polished; he makes smarter passes, he doesn’t score quietly and he’s already become a trusted floor leader. Collison is one of those rare cases where staying in college until his senior year was actually very beneficial to developing his game. It wasn’t all that bad for Holiday. He penetrated the lane plenty of times against the Pacers, using his improved handles Doug Collins had him work on the entire summer. After three games though, Holiday is averaging just three assists and continues to struggle overall. Speaking of Evan Turner, the rookie set a few career highs Saturday night. He played in 33 minutes (more than anyone besides Brand and Iggy)and he shot the ball 11 times (previous high was 10 against the Heat). ET added seven rebounds. Over the course of this first month in the season, Turner is continuing to find his niche on the court. His shot selection was a little off Saturday night but it’s encouraging to see him play aggressively on the offensive side. Remember in the Orlando Summer League he looked lost competing against guys who aren’t even in the League now. Philadunkia nation should be content with Turner so far. One glaring weakness that will likely keep teh Sixers out of the playoffs, is the problem at center. Countless number of times Saturday Elton Brand was forced into the center position, garnering matchups against Roy Hibbert and Josh McRoberts. The Pacers exploited these matchups and the 76ers were forced to double-down, leaving Danny Granger (22 points) and Mike Dunleavy (16 points) uncontested on several easy jumpers. Backup center’s Marreese Speights and Tony Battie combined to play 17 minutes and rebounded the ball just five times. Spencer Hawes was the starter at the five spot but managed just four points and two boards. This lack of production from any big man is not only going to leave the Sixers near the basement, it could stunt the development of our young guards. Holiday and Turner are forced to do too much on their own because they fear once they kick the ball inside the possession is going to be over. This can put too much pressure on a young guards shoulders. Rod Thorn and the Sixers scouting crew needs to be lining up some backup options before it’s too late to salvage the season. One final bright note from Saturday was Thaddeus Young. Thad had his second double digit game off the bench against the Pacers, pouring in 11 points, seven rebounds and two blocked shots. So even though his junper still appears to be broke and he made some boneheaded plays Friday night, Thad is stuffing the stat sheet in the opening week.